The talkies of video games wouldn't come until 1980, with Berzerk, Gorf and Intellivoice. But 1978's Speak & Spell undoubtedly contributed to the DNA of early gaming. Vintage Computing talked to Richard Wiggins, the man who wrote its voice processing algorithms, and reminds us just what a thunderbolt this so-called child's toy was when it struck 30 years ago. Speak & Spell's origins, in a way, flow from the U.S. government. Wiggins began his career as a civilian working with the Air Force, writing code to process digitized voice signals. Texas Instruments hired him because they had government funding to explore the implementation of voice coding in some new technology for the time. TI had earlier produced "The Little Professor" — a non-speech math tutor, for lack of a better description — and was looking to follow it up. A spelling tutor was brainstormed. To succeed, a spelling tutor had to be able to call out the words without, obviously, displaying them, so that the user could then attempt a correct spelling and be told if it was right or wrong. That's where Wiggins came in. Says Wiggins, in describing the machine's linear predictive coding, which generated the speech. Today, the speech could easily be recorded and stored in large digital memory chips. But in 1976, memory chips were not capable of storing that much data. We considered generating the speech from phonemes or sound fragments but the speech quality was not sufficient. A digital filter could be used and the time varying coefficients could be stored in memory but the amount of computations involved seemed too great. 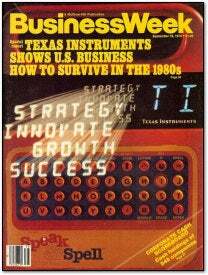 Once TI managed to produce a synthesis chip cheap enough to make a consumer device, Speak & Spell hit the scene. BusinessWeek devoted a cover to it, touting it as an example of innovation in a business climate somewhat similar to present times. Of course there was the noteworthy cameo in E.T. : The Extra Terrestrial, when it was used to "phone home." Today, we are in an age where voice recognition represents something of a cutting edge of gaming, and voice synthesis in gaming is largely irrelevant, made moot by the playback of voice acting and a game's soundtrack. But in earlier days, games and toys that could talk were as much a novelty and a wonder for kids as talking cinema was for their ancestors.